At Toi Ohomai, we believe that hard work and achievements deserve to be celebrated. With awards season in full swing, we are proud to have been involved in two award ceremonies over the past two weeks, which saw inspiring young athletes and emerging businesses recognised for their achievements. 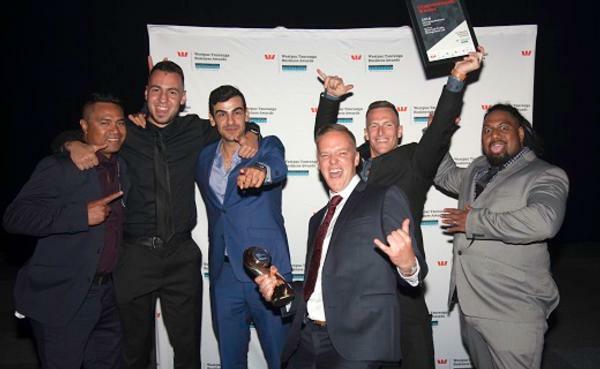 Toi Ohomai sponsored the Emerging Business category for the 2018 Westpac Tauranga Business Excellence Awards. The awards give businesses the opportunity to benchmark their success against other local businesses, including those outside of their own industries. Road Safe Traffic Management Ltd won the Emerging Business category at this year’s awards, gleaning top honours among several high-calibre finalists. The company assists with expert road traffic management and event traffic management. "To come out and win Emerging Business and be a finalist in the ACC Workplace Safety Award is really awesome and just proves all our hard work is paying off," says Logan Dawson, Owner and Operator. The award was presented by Toi Ohomai Chief Executive, Dr Leon Fourie, who said that the small businesses sector is pivotal to the success of New Zealand’s economy. Celebrating its 50th anniversary, the Bay of Plenty Sports Awards were held at ASB Arena in Tauranga on Friday, 16 November. The awards have a long and prestigious history in the region and recognises all aspects of sports from local clubs and volunteers right through to individual athletes at the top of their careers. Sport and recreation is a booming industry, supporting more than 30,000 jobs in New Zealand and Toi Ohomai is proud to play a significant role in fostering that growth through highly respected sports and recreation courses and sponsorships that celebrate hard-working, dedicated athletes, coaches and officials who have made their mark on the industry. This year, Toi Ohomai sponsored the Secondary School Sportsman – and Woman of the Year categories at the awards. “We were so privileged to have been able to honour sportspeople who, at such a young age, are already flourishing and set to achieve even greater heights in the next phase of their sporting careers. As an institute, we are proud to support these athletes to continue to work hard, improve themselves and reach their potential,” says Rachael Gardiner, Toi Ohomai Group Leader for Health and Humanities. This year’s Secondary School Sportsman of the Year award was presented to Sam Tanner from Bethlehem College for his achievements in cross country, athletics and surfing, while the Secondary School Sportswoman of the Year award was presented to Frances Lloyd from Tauranga Girls' College for Taekwondo. “Both these phenomenal young athletes have represented the country on the world stage and we admire their dedication, commitment and determination to reach their goals and realise their dreams,” says Rachael.